Torino and all Piemonte will be the next stage of Europe’s largest choral event: from July 27th to August 5th 2012 the Festival Europa Cantat XVIII Torino 2012 will be on stage, with moments of singing, study, party, musical and human enrichment for all those who will be around! Now in its eighteenth edition, for the first time the Festival Europa Cantat arrives in Italy and aims to attract 3000 participants coming from all over the world. Torino will receive single chorists, entire choirs, vocal groups, internationally famous conductors and lecturers, composers and singing lovers, prestigious choirs and orchestras. For ten days the city will resound with thousands of voices coming from everywhere; the colors, the languages, the sounds and the traditions of the European continent will intertwine with Torino’s cultural heritage. There will be 50 atelier and more than 100 concerts in churches, halls, outdoor that will see the performances of important guest formations, participating choirs, local groups, festival’s ateliers, bands and folkloristic formations. A particular emphasis will be assumed by certain events that will involve the most famous musical institutions of the City. This great event wants to bring to life the musical territory and lead its participants to discover the main sites and the hidden gems in Torino and Piemonte. The Europa Cantat Festival is one of the most significative activities of the European choral federation, which, since its debut in the middle of last century, wanted to promote tolerance and peace through common singing and intercultural exchanges of choral repertoire. All this inside a Europe recovering from a devastating conflict but that still had to confront itself with internal and political divisions. 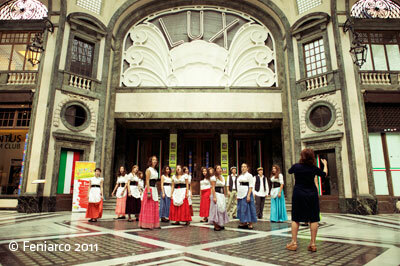 A festival for youngsters and adults, with the aim to unite, through music, traditions and cultures of the whole world. The first festival was held in Passau, Germany, during 1961 and the last in Utrecht, Netherlands, in 2009. The next stage will be all Italian.